When it comes to dungeon maps, I favor utility over artistry. Maps with rendered furniture and torchlight shadows are nice, but if they’re only seen by the GM, they’re not very practical. I want maps that are clear and make layout with dungeon tiles easy. If they can convey additional information without being too busy, all the better. 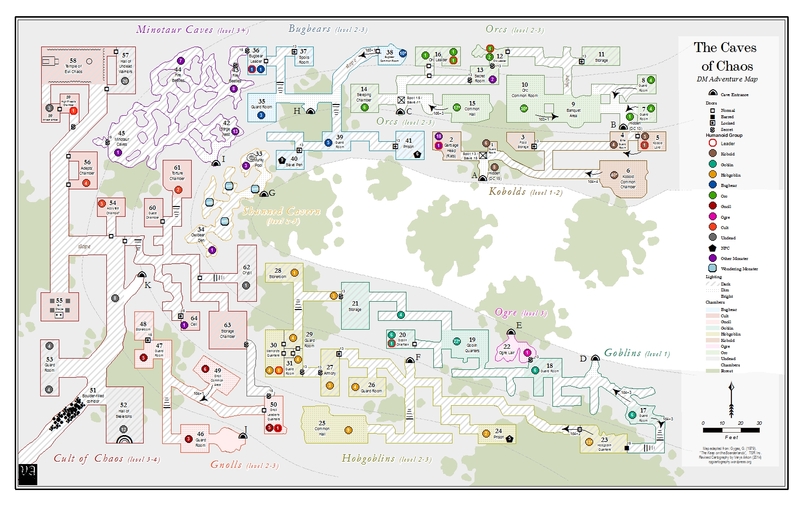 Given the above, I really like this map of the venerable “Caves of Chaos” I found on The RPG Cartography blog. Not only is it practical but it contains a lot of useful information without being overdone. The only thing it’s really lacking is a square grid, though that might have clashed too much with the other elements (maybe tick marks on the outside of the walls could have been substituted...?). I’m not sure how much use I’ll get out of this map, but it’ll definitely be a model for ones I make myself in the future. (Note: The first link is to a JPG of the map, but the PDF you can download from the second link is much higher quality).